My classic Canadian Thanksgiving weekend got a little atypical towards the end. We ate turkey, took nice fall walks, fit in a couple of horseback rides, spent time with family...the usual. But then on Monday, after a lunch of turkey leftovers and one slice each of my mom's apple and pumpkin pies, I picked up a recently butchered goat from my cousins' house, and hauled it home to debone. 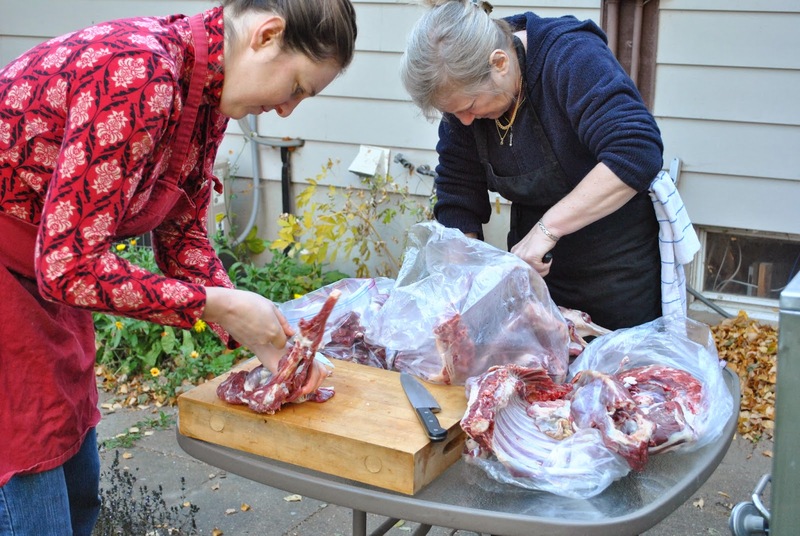 Not your typical Thanksgiving activity—deboning a goat. Why was I deboning a goat, you ask? Well, it's something of a long story, but I'll try to keep it short. I am on the Steering Committee for Slow Food International's Saskatoon convivium (check us out on Facebook). We work to raise awareness about good, clean and fair food, and often do so by coming together to enjoy good food. So we put on events, and we are lucky enough to be hosting Michele Genest, author of The Boreal Feast for a reading, presentation and stand-up small plates dinner at my house, cooked by convivium leader (and wonderful mentor) dee Hobsbawn-Smith and myself. And one of the recipes we're making is Goat Sausage with Juniper and Blueberries. So there we were, spending our Thanksgiving afternoon cutting the meat off a fresh goat carcass. Have I mentioned my unusual fascination with cutting up meat? Many of my ancestors were butchers; I am always surprised by how happy I am while in the midst of slicing through raw meat and bone. In the end, we had 15 lbs. of goat meet, which was half again as much as we needed for the dinner. We'll have extra sausage to give to the people who raised the goat, as well as for ourselves. We also have more than 15 lbs. of goat bones. There is much stock to be made. I had no idea how goat stock or goat soup would taste, but I went for it anyway. I roasted some of the bones for about an hour at 400F and then added them to sautéed carrots, onions, celery, a whole head of garlic, fresh rosemary and thyme, peppercorns, parsley, covered the whole thing with water and simmered the stock overnight. I had in mind a chickpea and goat soup I tasted on a day tour to Tangiers many years ago, so I cooked some chickpeas, cut the goat meat off the bones, and opted for Moroccan flavours for the soup. I've decided to give away the remaining goat bones to other people who would benefit from good bone broth, because I now have 7L of goat broth in my freezer, after I made a healthy batch of soup. If you ever find yourself with a pile of goat bones, or goat stock, try this soup. It was surprisingly delicious. My husband gave it two thumbs up; D ate a whole bowl of it; but, G found it wanting. You can't please everyone all the time. I think he was just thinking ahead to the leftover pumpkin pie for dessert. Heat olive oil in a soup pot. Sauté onion, carrots, celery and garlic for a couple of minutes. Stir in spices and sauté another minute, or until the spices are fragrant. Add the goat meat, chickpeas, tomatoes and stock and bring to a simmer. Simmer for 10 to 15 minutes, to allow flavours to blend. Add red pepper and spinach and cook five minutes more. Season to taste with salt and pepper.